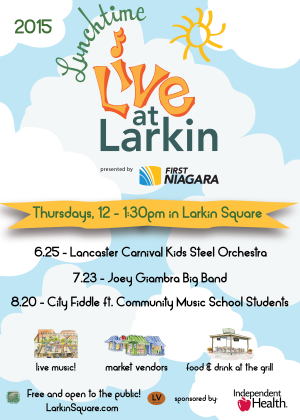 Lunchtime Live at Larkin, presented by First Niagara and sponsored by Independent Health, turns lunchtime into an event! Join us on from noon to 1:30pm on three summer Thursdays. The Grill will be open serving up seasonal lunchtime offerings. Black Market Food Truck will also be in the Square. The Filling Station will be serving take-out-only as Larkin Square is transformed on the following lunch dates!